Wood River junior defender Miguel Velasco played a prominent role in Thursday’s 1-0 Wolverine victory over defending state champion Blackfoot, in the State 4A tournament opener at Idaho Falls. Boosted to victory by defense and a timely goal, Wood River High School’s boy’ soccer team is looking squarely at the prospect of state tournament hardware after Thursday’s 1-0 victory over the reigning State 4A champion Blackfoot at the Idaho Falls Soccer Complex. 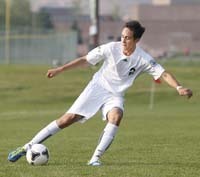 Junior Andrew Graves headed home a bouncing ball in the box in the 19th minute of Thursday’s opener of the Idaho High School Activities Association tournament as Wood River (13-1-4) posted its 13th shutout in 18 games. The Wolverines withstood a withering second-half assault by eastern Idaho champ Blackfoot (13-2-1). With Graves’ fifth goal of the season giving the Wolverines their fifth 1-0 victory of 2012, Wood River earned a semi-final berth today, Friday at 2 p.m. against the winner of Thursday’s preliminary game between Sandpoint (11-5-2) and Bishop Kelly of Boise (10-6-3). Coach Luis Monjaras said, “We scored on a play down the right flank that went to Alex Lopez, who centered it and the ball started bouncing by itself. Andrew headed it into the goal. In the second half Blackfoot came out strong and had lot of direct kicks and corner kicks. Max (goalkeeper Mauldin) did a great job catching them and our defense was able to clear. Championship game is Saturday at 4 p.m., preceded by the third-place game at 1 p.m. Two years ago at Lake City, Wood River dropped its first game 1-0 to Bonneville and then won its first-ever State 4A tournament trophy for taking third place. In the girls’ competition Thursday at Idaho Falls, last year’s state consolation champion Century High School from Pocatello handed Wood River (11-7-0) a 2-0 loss. Coach Jenni Conrad’s Wolverine girls try to stay alive today, Friday at 11 a.m. in a loser bracket game against the Kuna Kavemen. The northern Idaho champ Moscow Bears (10-6-2) scored an overtime golden goal Thursday to oust Boise-area runner-up Kuna from championship contention.